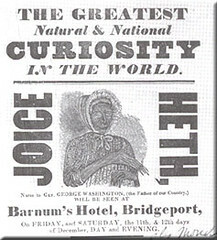 Lately I've been fascinated by Joice Heth. She was an elderly African American woman whom P.T. Barnum displayed in several northeastern U.S. cities in the 1830's billing her as the 161-year-old former nurse of George Washington. Exploiting Heth in this freak-show actually gave Barnum his start in the "entertainment" industry. But while I'm interested in "human zoos", freak-shows and the potential for humans to treat others horribly, I'm most interested in the intersection between race, propaganda, and science that we find in the case of Heth's dissection. "Heth's autopsy appears as a moment in which science--mediated by popular journalism and other mass media--faced some of the crisis of legibility, authenticity, and recognition brought on by the process of modernization." So was Heth really that old? Of course, many suspected that Barnum and Heth were not telling the truth, and so to solve the issue they needed a purely objective means of inquiry. Enter science. At Heth's death, Barnum made a small fortune by selling tickets at 50 cents apiece to 1,500 people who would witness Heth's dissection on a make-shift operating table set up in New York's City Saloon. Dr. David Rogers performed the autopsy and concluded that Heth was a fraud, not more than 80-years-old. But then Barnum two days later said Heth was still alive, and the autopsy was performed on a Harlem woman called Aunt Nelly. There's no doubt that Barnum was playing a confidence game. But so was science. Racial anatomists at the time, such as Dr. Caldwell, claimed he could more easily distinguish between black and white human skeletons than a dog from a hyena or a horse from an ox. Science was being used to propagate some pretty evil agendas at the time. Legal decisions like Dred Scott and the Fugitive Slave Act were decades away, and they were heavily impacted by racial "science." Joice Heth, I'm sorry people treated you and your corspe so disrespectfully. We gotta get together. There's a paper in this. Two words: Hottentot Venus. Sadly there are still those who believe race is a biological reality, despite 150+ years of failed experiments to show it so. To call it "science" is as much a misnomer as the phrase "creation science." If a concept in the physical sciences had failed so miserably, it would have been dumped long ago. Check out Vince Sarich's book "Race" for a relatively recent example of such nonsense. Your story reminds me of that of 'Truganini', the last of her group of natives from Tasmania. Anthropologists of the 19th C thought of her people as a 'Missing Link'. Grave-robbing, although illegal, was common, and the remains of her people were sold to research labs across Europe. Very much fearful that her remains would end up in someone's lab, she requested that at her death her remains be cremated. Instead, when she died she was buried, and two years later her body was exhumed and then put on display. A hundred years later, in 1976, her body was finally cremated.